Prairie Grass Observatory is located under dark rural skies at Camp Cullom (Clinton County Foundation for Youth), between Mulberry and Frankfort, Indiana, and is available to the public. Technical assistance is provided by the Wabash Valley Astronomical Society in Lafayette. The observatory has four telescopes: a huge 28" aperture Dobsonian, a 16" LX200R Schmidt-Cassegrain telescope, a 16" Newtonian telescope, and a 7" apochromatic refractor. The observatory also has a pair of giant 25/40X100 binoculars, and a hydrogen-alpha filter for solar viewing. Click here for more info on these scopes and other equipment at the observatory. The 2019 Star Party will be held July 23-28, 2019. Pictures from last year's event start here. The International Space Station and other satellites can be viewed through the observatory's 16" LX200R telescope. In order to avoid bright headlights in the observing area, please use the parking lot east of the Nature center. The observatory is also available at special request for group viewing events. Contact Russ Kaspar at rk@kasparradio.com or John Mahony at jmmahony@hotmail.com. Need directions to the site? Here's a map (includes a map of Camp Cullom). Prairie Grass Observatory is an official asteroid tracking/discovery station. 20 asteroids have been discovered at PGO, and numerous follow-up observations of newly discovered near-earth asteroids have been made. The observatory has two "Yahoo Groups" e-mail lists. Both are open to the public. The first, on the left, is the "official" observatory mail list and is used primarily only for notices of public events at the observatory. 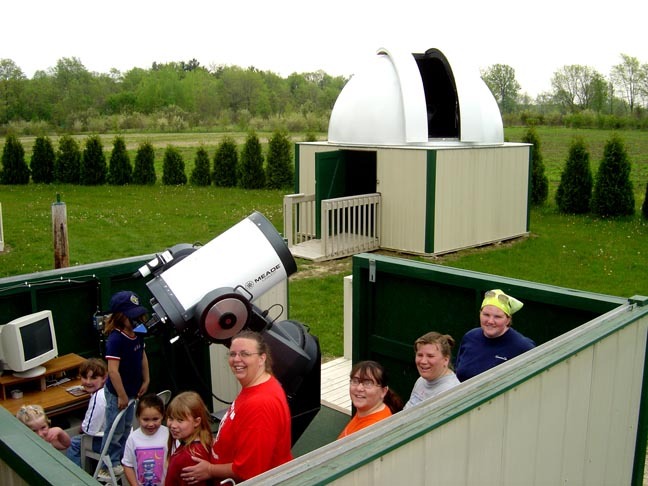 The second, on the right, will also include notices of events at nearby astronomy clubs, and can also be used for general discussions of astronomy and telescope equipment, and can be used by local amateur astronomers in the area to arrange observing get-togethers at Camp Cullom or elsewhere. The observatory is named "Prairie Grass Observatory" because it is located in the middle of one of the largest stands of native prairie grass in the state. Click here to see Clinton County's light pollution ordinance. For more information on the observatory itself, contact Russ Kaspar at rk@kasparradio.com or John Mahony at jmmahony@hotmail.com. Camp Cullom phone: (765) 296-2753 Note that this is the camp ranger's home phone, do not call after 10 pm!